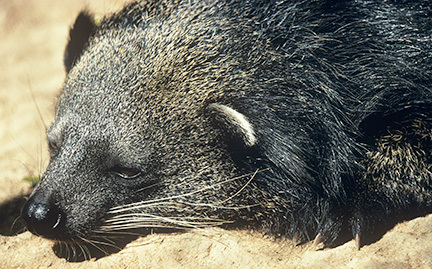 Native to south and southeast Asia, binturongs are nocturnal and mostly arboreal, or tree-dwelling. Also known as bearcats, they are important seed dispersers and help replant the forest. Females can delay implantation of embryos in order to coordinate the birth of young with favorable conditions, one of the few mammals to do so.